A new program turns your PC's microphone and speakers into Kinect. A few years ago, the combined power of a camera, a microphone and the software know-how of Kinect wowed us with its translation of simple gestures and voice commands into something the Xbox 360 could understand. 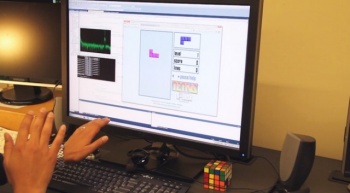 Now, Microsoft - along with researchers at the University of Washington - have figured out a way for us to have all the gesture recognition of Kinect using existing PC peripherals. The application is called SoundWave and it operates using sonar detection similar to how a bat or dolphin can "see". SoundWave uses your PC speakers to blast out ultrasonic noises that your ears can't detect. The sound waves bounce off your hand or body and the PC microphone detects the change in frequency. The phenomenon is called the Doppler effect, and SoundWave crunches the numbers of the changed frequencies to accurately track the position of your body in real time. The best part is that SoundWave works at a sub-sonic level, so it won't interfere with you listening to loud music at your desk. The research team of Sidhant Gupta, Dan Morris, Shwetak Patel and Desney Tan report that SoundWave has a 90 to 100 percent accuracy rate, even in an area with a lot of noise disturbance like a public coffee shop or airport. Of course, people will likely point and laugh at you for waving at your computer, but the concept is pretty cool.